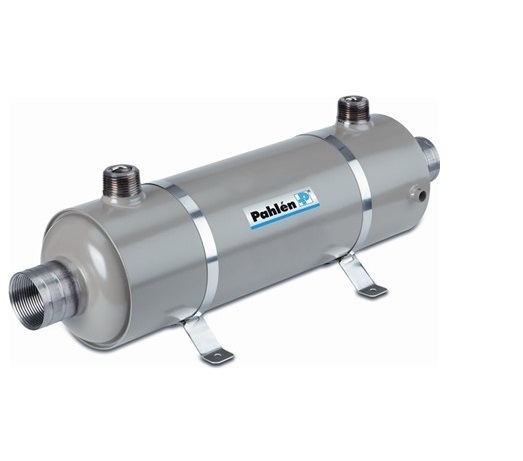 Size primary system: 1 "
Size secondary system: 1 1/2 "
Manufactured by Pathlen in Sweden Hi-Flow titanium is a heat exchanger model T40 with excellent heat transfer capabilities. The unit is intended for swimming pools and other applications where there is a demand for high flow rates together with a low-pressure drop. Titanium is chosen for its high resistance of corrosion and is therefore suitable for pools and spas with aggressive water, salt water and where a salt chlorinator is used. The titanium heat exchanger is light and compact with welded jackets and pipe system for the transfer medium. Titanium heat exchangers can be installed together with boilers, heat pumps, solar panels or other heat sources.